Is the "Abolish ICE" movement significant? Is it serious? US Immigration and Customs Enforcement was created in 2003 with the establishment of the Department of Homeland Security after the 9/11 terrorist attacks. ICE is the agency within DHS responsible for enforcing immigration laws within the interior of the USA. Note that US Customs and Border Protection, of which the Border Patrols is a sub-unit, serves an analogous function at the nation’s borders. Stemming in large part from the political and public relations fallout over the deliberate policy of family separations put in place by the Trump administration beginning in Spring 2018, activists on the left side of the US political spectrum began using the slogan “Abolish ICE” to galvanize public opposition to family separations and alleged inhumane practices on the part of ICE officers. Allegation have been made of, among other things, racial profiling, sexual assaults, and harassment and detention of US citizens. Several high profile incidents have occurred, including a woman, associated with the protest group Rise and Resist, who climbed onto the Statue of Liberty on July 4, 2018 and caused a three hour standoff with police; she was subsequently arrested. Protests also occurred nationwide outside of ICE offices at the beginning of this month. The slogan and the movement behind it received a huge boost with the upset win of Alexandra Ocasio-Cortez, a self-described socialist,who beat longtime establishment Democrat Joe Crowley in the primary for the 14th Congressional District in New York City. The district includes much of the Bronx and Queens. 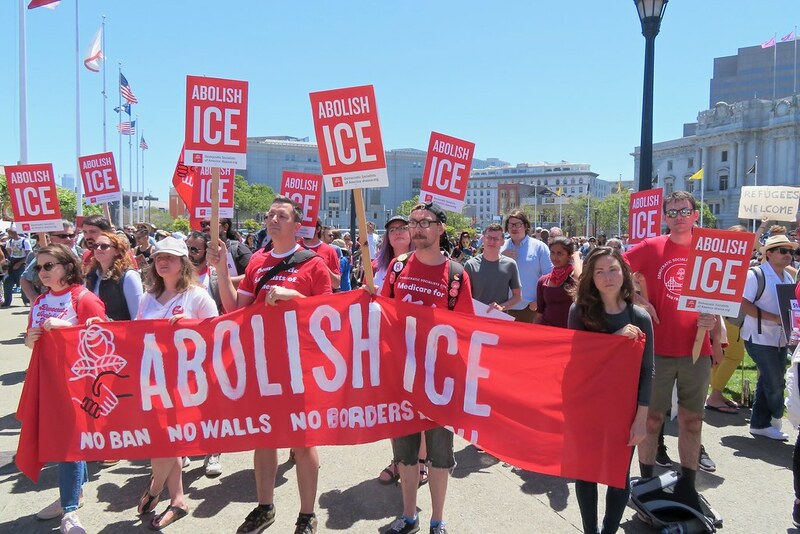 Subsequently, other Democratic politicians have taken up the call to “Abolish ICE”, including Sen. Kirsten Gillibrand (D-NY), New York City Mayor Bill de Blasio, Sen. Elizabeth Warren (D- MA), Sen. Kamala Harris (D-CA) and Rep. Mark Pocan (D-WI).